Each Affiliate can register from TWO Categories of Business by paying just 50% more for the additional category. Also please note, Networking Square does not have any category for any MLM product and services. PLEASE NOTE THAT THE "REGISTRATION FEES" ONCE PAID ARE NOT REFUNDABLE, ALSO ONCE YOU GET INDUCTED / INITIATED IN THE CLUSTER THE "ANNUAL AFFILIATION FEES" ARE ALSO NOT REFUNDABLE. Cheque to be drawn in favor of "NETWORKING SQUARE PRIVATE LIMITED"
(i)That the above stated information is true & correct to the best of my knowledge. (ii)That I will be truthful & honest in all my dealings with the fellow affiliates of Networking Square Private Limited. (iii)That I will always help my fellow Affiliates to generate more business for themselves by following the "Connect right Grow bright" philosophy of Networking Square Private Limited. (iv)That I will always adhere to the prevailing processes and policies of Networking Square Private Limited. In case I have any doubts about the same I will contact ONLY nominated personal of Networking Square Private Limited or founder Directors of Networking Square Private Limited and seek clarification and not discuss the same with the fellow affiliates. (v)That I will pay cheque bounce charges of Rs.500/- if any of my cheque gets bounced for any reason. 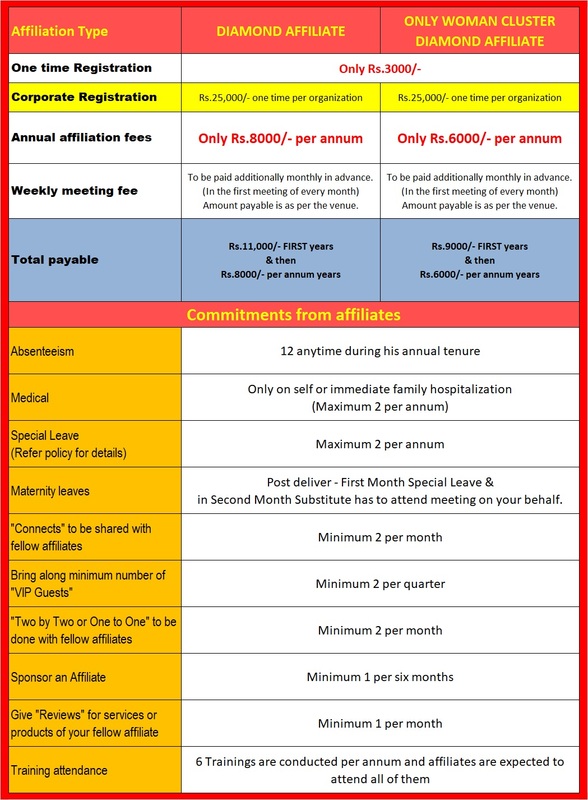 I also agree that if any of my cheques get bounced, I will issue a fresh cheque with the additional amount of Rs.500/- within 48 hours of information to me and if I fail to do so this then Networking Square Private Limited is free to allocate my category & seat to any other interested business owner or organization. (vi)That once I click on "Submit" it should be considered that I have signed & executed the document & I have accepted and have agreed to all the above terms & conditions and other prevailing policies of Networking Square Private Limited. (Vii) That I am aware that all fees & or affiliation charges once paid are not refundable for any reason. (vii)That I have executed this application out of my own free will and without any pressure or influence from anyone or any side, in good / sound physical and mental state.